DENVER -- Colorado Avalanche center Matt Duchene, the team's leading scorer, is expected to miss about four weeks with a sprained medial collateral ligament in his left knee, the Avalanche announced Monday. 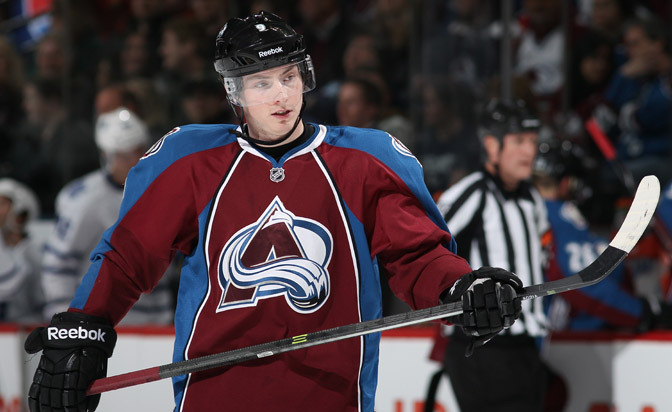 Duchene, who has 23 goals and 47 assists in 71 games, was injured on his first shift in a collision with linemate Jamie McGinn on Saturday in the Avalanche's 3-2 win against the San Jose Sharks at Pepsi Center. "He'll be out approximately four weeks," Avalanche coach Patrick Roy said after practice Monday. "We'll know more after, but that's the first I heard from our doctors. We'll take our time. We'll be patient." Duchene will miss the Avalanche's final eight regular-season games and most likely the first round of the Stanley Cup Playoffs. On his personal Twitter account, Duchene wrote: "The thought of not playing in the first round for me has been devastating. We have outstanding medical and training staff that will be helping me get healthy ASAP. I will be doing everything in my power to be ready for Game 1. And if not then, shortly after." "We were both trying to get out of the way," McGinn said. "Just one of those freak plays and an injury happens. We were both going for the puck. It's one of those freak accidents in hockey. I talked to him, texted him to make sure, just to stay positive. We'll see what happens." Colorado (47-21-6) has clinched its first postseason appearance since 2009-10 and is in second place in the Central Division, leading the third-place Chicago Blackhawks (42-19-15) by one point (100-99) with two games in hand. The Avalanche are playing for home-ice advantage for a potential first-round series with the Blackhawks. "We've been finding ways to win since the start of the year," Roy said. "We'll continue to find ways to win." Roy pointed out that the Avalanche won the Stanley Cup in 2001 despite losing star center Peter Forsberg to a spleen injury. "When we're talking about changing the culture of our team, this is one thing," Roy said. "We're a team and that's the way it was in 2001, it was about the team. Peter was a very important player on that team, don't get me wrong, but our culture was we had to work hard every time we were on the ice. We had to find ways to win hockey games. That's what this team has been doing all year. This is what we're talking about when you're talking about a team changing their culture. "We're not looking for an excuse, we're looking for a solution. We're also looking for an opportunity for other guys. We have depth and a lot of confidence in our players. Our players have a lot of confidence in themselves. It's a team concept, it's how we've been winning our games. It's not going to change." Rookie Nathan MacKinnon will replace Duchene at center on a line with left wing Ryan O'Reilly and McGinn on the right side. Paul Stastny will center a line with left wing Gabriel Landeskog and right wing John Mitchell, who went from third-line center to the unit with O'Reilly and McGinn against the Sharks after Duchene was injured. "I played with both those guys in the past," MacKinnon said of O'Reilly and McGinn. "I'm not going to try to replace [Duchene]; you can't. He's been one of our best players all year. It's not about replacing [Duchene], I'm just going to try to help the team win and hopefully create some chemistry with those two guys." A natural center, MacKinnon has played most of the season as a right wing. He leads all NHL rookies in goals (23), assists (33) and points (56) in 74 games. "We've all played together with different guys," Stastny said. "Fortunately, we have a lot of centers and wingers who can play different positions and that helps out a lot. Patty's got different combinations where he can put different guys. We've had four, five or six guys hurt, whether it's for an extended amount of games or a shorter time, and you just have to deal with it. "Patty's done a good job of not letting us be down about it, not worrying about who's not playing and doing the best we can to keep winning. That's what we want to do and that's what our focus is. We clinched, and that's good, but now we have eight games left and we want to keep getting better and we want to peak at the right time. We don't want to end the season on a slide." Roy addressed the team before and after practice Monday to emphasize that losing Duchene can't be used as an excuse, and that the Avalanche still have plenty to play for after securing a playoff position. "First of all, I wanted them to know I'm proud of them for what they've accomplished this season since the start of the year," he said. "Secondly, we're not satisfied. We want to have home-ice advantage. We're in that battle right now. We've been talking about that. We start to prepare ourselves for those teams and try to bring our team to another level." The Avalanche expect to get some help for the postseason with the eventual return of right wing PA Parenteau, who sustained a sprained MCL in his right knee March 10 against the Winnipeg Jets and might play in the April 13 regular-season finale against the Anaheim Ducks. "We hope that he could play the last game of the season in Anaheim," Roy said. "If not, we're pretty confident he will be back for the first [playoff] game." 100 pts & playoff bound is something all of us have been working towards for a long time. Something to be majorly proud of #AvsNation ! ...will be helping me get healthy ASAP. I will be doing everything in my power to be ready for Game 1... And if not then, shortly after! We are a helluva team ready for the playoffs. Thanks to all of you for your thoughts and prayers they are greatly appreciated! #WhyNotUs !